Dr. Christian Raschner is a professor in the Department of Sport Science at the University of Innsbruck, Austria and director of the Olympic Training Center in Innsbruck. He is working in research projects related to alpine ski racing including talent detection, selection and development in alpine ski racing (since 1996 cooperation with ski boarding schools and provincial ski teams). 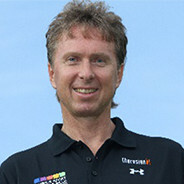 He has been engaged in fitness testing in ski racing since 1993, and is responsible for the fitness testing of the athletes of the Austrian Ski Federation and youth ski racers since 1996 (e.g. Skigymnasiums Stams, ski boarding school Neustift and provincial ski teams). Prof. Raschner is also working in the development of strength training devices and methods for alpine ski racers in cooperation with two Austrian firms (e.g. coordination oriented strength training devices for youth and elite athletes and mechatronic based strength training devices (e.g. active motion, evolution and lifter). Many youth and top level ski racers are coached in the Olympic Training Center. Furthermore Prof. Raschner is father of a professional 21 year old ski racer who had his first FIS World Cup starts this season 2015/16.